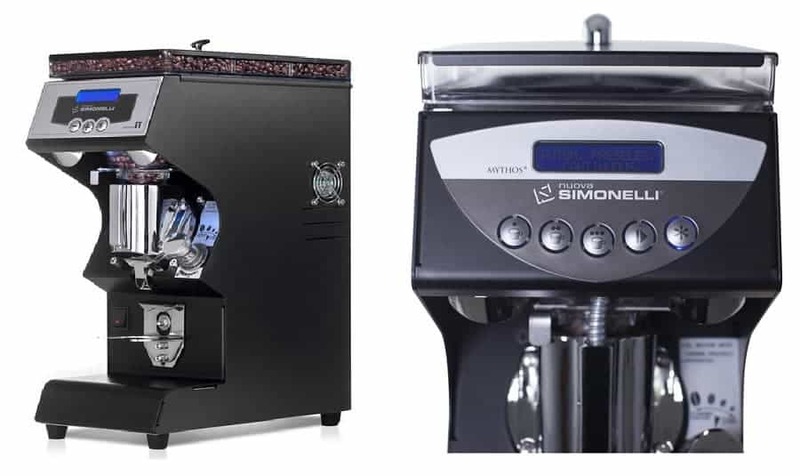 Nuova Simonelli Mythos One Clima Pro is a commercial espresso grinder. It got a slightly different footprint than most other espresso grinders. There are a few different things that make it just really exceptional in terms of how it is constructed and what the results you get out of it. Designed with the help of barista champions and professionals, Nuova Simonelli’s Mythos One is an all-around redesign of what an espresso grinder should be. From its minuscule grinder tension to revolutionary Clima Pro Technology, the Mythos One is packed with features that will make it your new favorite espresso grinder. At the top of the machine is a 2.8 pound bean hopper. Again, this is not really a conventional large hemispherical hopper. This is more of just a tapered hopper. It’s got a shutoff that can be opened and closed. When it is opened and mounted in the grinder, the hopper cannot be pulled out, a kind of safety catch. Down below is a 75 millimeter steel flat burrs set coated in titanium. They are a little more hardy, to stay sharper and more durable for longer use. These burrs are mounted in such a way that there is a very short path from the hopper to the burrs. An even shorter path from the burrs out the spout into your portafilter. The Mythos One uses what Nuova Simonelli calls the Clima Pro Technology. Inside is a heating element, and in the back of the grinder (near the motor and on the side) are two fans. The heating element, the fans and the ducting system work together in concert to keep a very, static temperature i.This means that the Mythos One Clima Pro is able to produce more consistent shots throughout the day, regardless of volume. The micrometric adjustment knob is very, very easy to adjust with one hand. You do not have to wrestle with a collar as you might experienced in some other grinders. Very simple to precisely dial in where you need your coffee to be. Down the machine are portafilter forks. There is actually an upper fork as well, so you can do hands-free. Just slide the portafilter in and let it do its thing. It also has the momentary switch for actuating the grinder. The spout is a little bit unique. It actually has a membrane right below the burrs. That membrane basically looks like fingers interlocking. They break up the clumps of your grinder, which creates a very, very fluffy, consistent grind. The grinder trench is between the edge of the burrs and that membrane. So small that you are seeing a grinder tension of about one to two grams, almost nothing at all. Grinding is exceptionally simple with three pre-selects. These can be programmed in as well. It can also grind continuously, grind two seconds or so, it can. Again, the grind quality is very, very fluffy. It is a bit sandy yet well-managed. There are not very much clumps. Meaning that the puck is going to be a much more consistent in density as well. No need to do much grooming before you are able to tamp. Here is one slightly difference of the North American version of the Mythos One from the European version. Though all the internals, that is everything is the same, just have some superficial differences. Koffeeone is a dedicated coffee machine wholesaler with more than 30 years experience and expertise. We are committed to providing 100% pure espresso coffee every time. Want to know more about these powerful products?